The excavator Ernest J.H. Mackay wrote: "Late III Phase (Pl. XIX [above]). Average level: – 9.9 ft. – A few walls only remained of House I, and it will be noticed that Fore Lane had been closed in by continuing the east wall of House I right across it to the northern wall of Block I on the opposite side. "Of House II nothing whatever was left save the well. The brick-robbing which took place upon the return of the population after evacuation of the city between this period and the next was particularly thorough here. 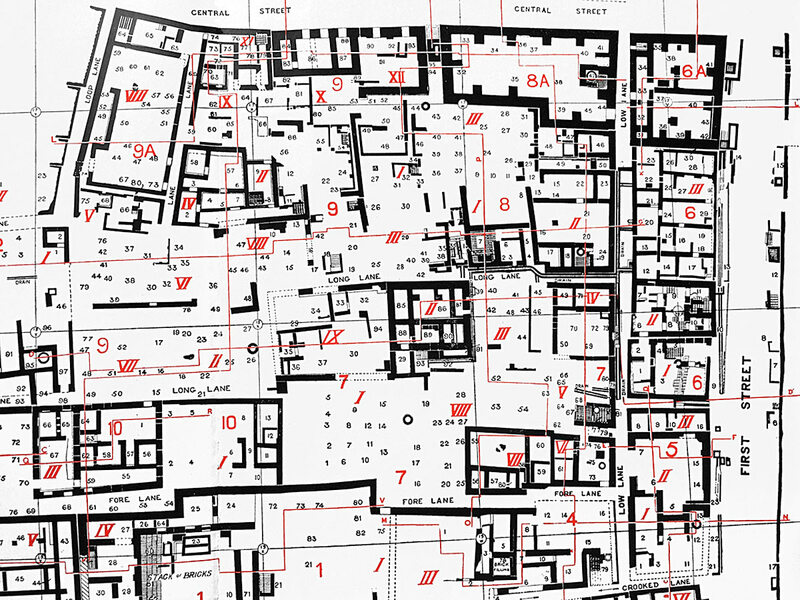 For some unknown reason, House III seems to have been spared; it still preserved its outward form and the arrangement of its rooms followed the same plan as in the three precious occupations. The house was entered as throughout-out the Intermediate Period at the S.W. corner. All the other unexplained and apparently unecessary doorways had been wholly or partially bricked up, and in the latter case, evidently served as niches or cupboards. Three very curious holes in the eastern wall of room 66, each some 7.5 incs. high by 8 ins. wide by 1 ft. 11 ins. deep, present a problem. What was their purpose, unless they held the supports of a loom or some other mechanical apparatus?